TVS launched the all-new NTorq in the Indian market last year. 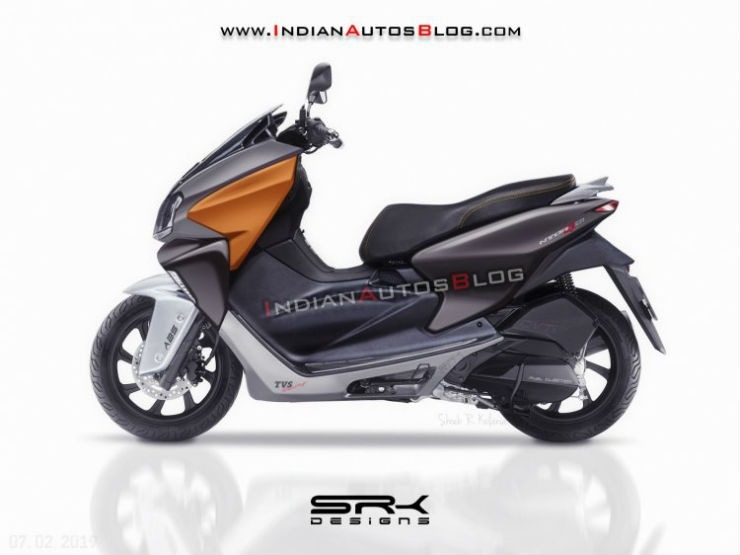 The Indian manufacturer is currently working in an all-new 150cc scooter, which will take on the likes of Aprilia SR150 in the Indian market. Here is a rendering that shows how the upcoming maxi scooter may look like in real life. This is the NTorq 150 based on the TVS ENTorq concept that was first showcased at the Auto Expo 2014. The NTorq 150 will be the flagship scooter of the TVS and will be the most expensive scooter in the market. The ENTorq 210 concept is a maxi-scooter, and this scooter is no different. It gets a big layered apron in the front with the headlamp positioned on the apron on the bike. The design of the scooter matches international maxi-scooters and is very attention-grabbing. The rendered image stays true to the design of the ENTorq 210, but the voluptuous design of the concept has been transformed into a sharp looking design. Looking at the TVS NTorq 150, it looks perfect for the long distance touring. It is very comfortable with a wide seat and a relaxed handlebar position. The rendered image indicates that the upcoming scooter may get upside down front suspension, which will ensure that the scooter gets a top-notch ride quality. The NTorq 150 may get big alloy wheels with disc brakes on the front wheel to ensure quick stop. There will be a single-channel ABS as standard in the upcoming scooter too. The NTorq 125 looks very sporty and gets segment-leading features like a smartphone-connected instrument cluster. The 150 version of the scooter is expected to get such similar features too. The upcoming NTorq may also get coloured TFT display with smartphone connectivity that takes the features to the next level. Currently, the NTorq 125 offers turn-by-turn navigation and caller’s name among many other features. TVS is yet to officially announce the launch of the upcoming NTorq 150, but it is expected to launch in the Indian market in the coming few months. The TVS NTorq 150 will get powered by an all-new, single-cylinder, air-cooled, fuel-injected engine that will churn around 12 Bhp and 12 Nm. It will come with a CVT automatic transmission. The all-new scooter will be a global product and will be available in many international markets too. The TVS NTorq 150 is expected to be priced at around Rs. 80,000 in the Indian market and will also take on the upcoming maxi scooters from the likes of Suzuki and Honda in the Indian market. The scooter market is extremely big in India and it is expected to grow only bigger in the coming times. The NTorq 125 is quite popular in the Indian market and the bigger sibling will only attract more customers. Scooters are preferred by many customers as they are more comfortable than motorcycles and offer a good amount of space to store things too.